Is MG production at Longbridge dead? | What Car? 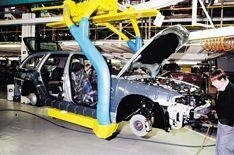 Is MG production at Longbridge dead? The project to revive production of the MG TF roadster at MG Rover's defunct Longbridge site is on the brink of collapse, according our sister site, autocar.co.uk. Supplier Stadco announced at the weekend that it was pulling out of a deal to make TF bodyshells for the Chinese carmaker Nanjing, some 18 months after signing a supply deal. Nanjing owns the rights to the MG TF design and planned to put the TF back into production in spring last year. Stadco's decision to stop manufacturing pre-production bodies is seen an indication that the Longbridge site might never see any kind of car making again. There have also been reports that the cost of re-engineering the TF to meet current and future legislation has also put the project into doubt. Nanjing has refused to comment about its plans now Stadco has gone.